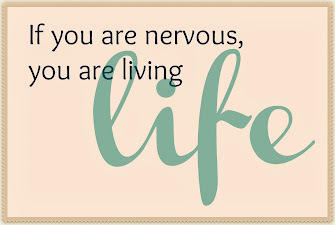 Everyday with my husband and daughters brings more of that 'stuff' I try to hold tight, by staying present. 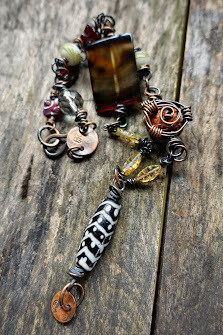 We all have our tools, one of mine is grasping whatever pendant I am wearing that day or a strand of very tactile beads. Bede means prayer. Ever since my brother died, 2 years back, prayer pieces are with me on a daily basis. Death changes the ones left behind. 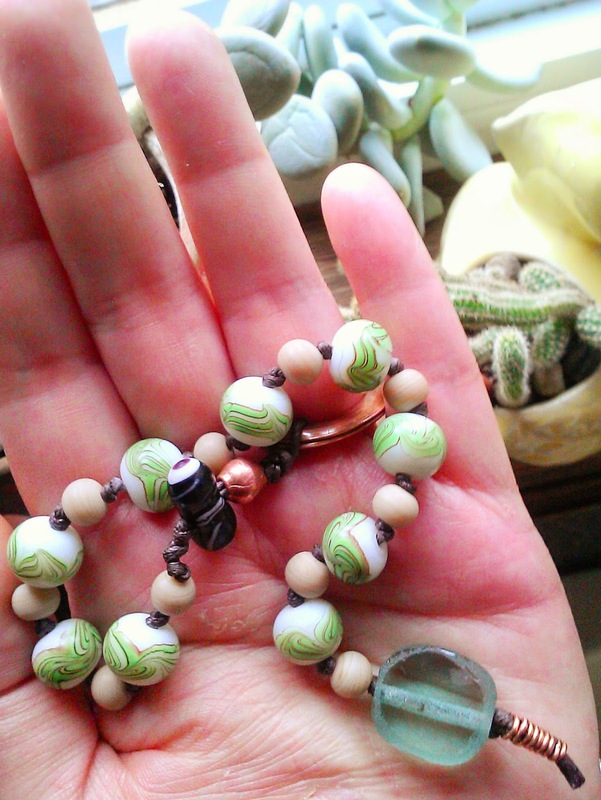 Above a simple knotted chaplet with nine main beads, spacers, personal large focal bead and peened copper ring, made recently on the bench to fit around a finger, is unseen in my palm when worn. The texture of the hand made etched Indonesian beads & etched ivory glass beads are that of sea glass with the clarity of the aqua focal a super calming 'water' almost attraction. Prayer beads are compelling. I have made different styles of rosaries and smaller versions or chaplets, since coming across Eleanor Wiley's book ' A String and a Prayer' back in 2004. 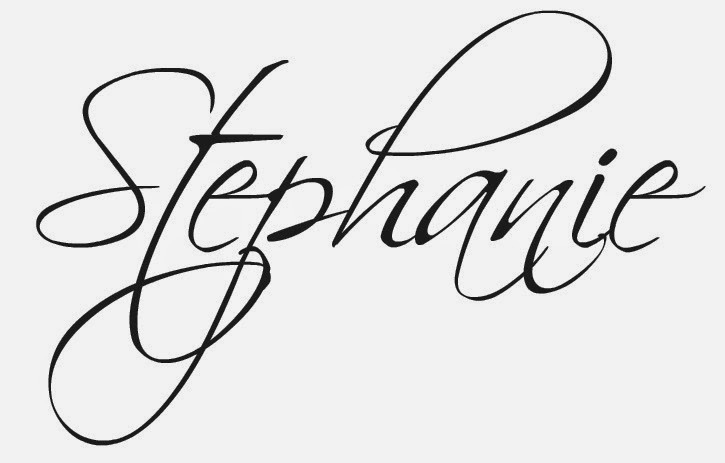 My spirit was tugging at me to create a very simple style. The first attempt yesterday was more involved with lots of different beads, colors, textures and lines. Yes...I cut this first attempt totally a part and continued using the beads that called to me while putting together the first chaplet. 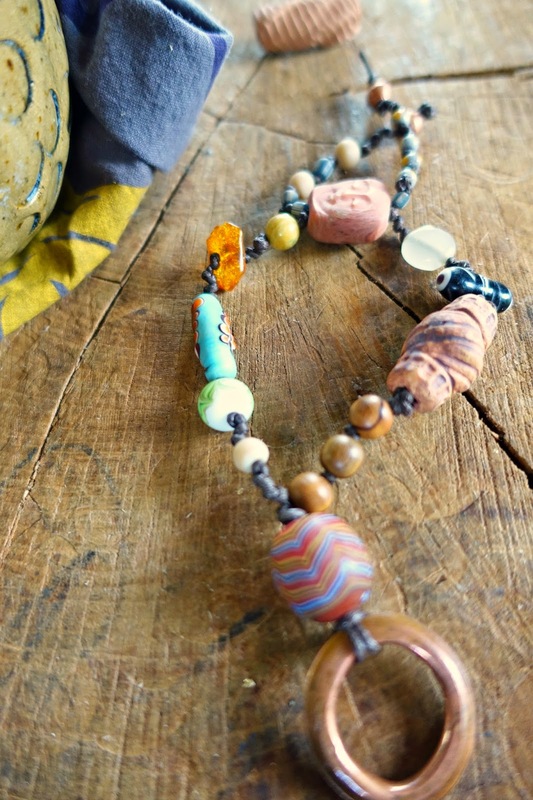 < I like the combo of amber, clay, olive wood, lamp-work and old beads but, not what I needed. 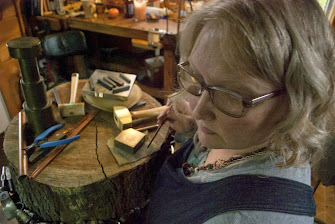 Jewelry making brings me back to center time and time again from first starting Fall of 1996 creating with my daughters, to improvisational bead embroidery on fiber sculptures, to beginning a love of metalwork 4 years later.